Going on an expedition with the right kind of gear gives some safety and comfort. As it requires already a lot of energy to make progress in difficult terrain, we rather spend our concentration on aspects of navigation, or the sense for nice photo motifs instead of having to think and worry about whether or not specific parts in our equipment will survive the trip. Traveling in high altitude really requires a lot of power, and if gear then simply 'works', we have less to worry about and have more freedom to actually enjoy the expedition. 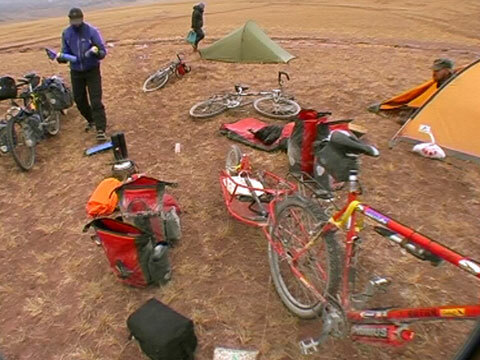 Thus, we try to use reliable, sturdy and robust gear on this kind of expeditions. However, this still means that a certain talent for improvisation is just as necessary, as unexpected things can always happen. Checking and sorting of gear before leaving highway 219. We will be totally self-contained for four weeks. During this expedition, we had absolute requirements for robust gear. Again, no compromises could be met. Or gear had to maintain its functionality during hot, cold and stormy weather, as well as in dusty or snowy environments. We took only few spare parts. Luckily there were only few problems, and these could be solved with improvisation and our experience.